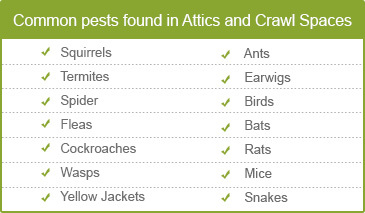 When was the last time you checked your attic and crawl space? Fail to remember? Not surprised really! A large number of homeowners ignore these functional areas until they turn into a full-blown disaster that spells extreme damage. To ensure the safety of your home and the well-being of your loved ones an inspection of the property is a must on a regular basis. Calling in a pro to clean out your attic and crawl space can eradicate the problem at its source. At Quartz Solutions, we provide the best in customer service and high standard of workmanship at affordable pricing. Neglecting the attic and crawl space can prove to be extremely consequential. Disgusting conditions may be festering in these regions which can gradually deteriorate and have an adverse impact on the health of your family. Moreover, it can trigger structural damage that can result in thousands of dollars of repair work. Leaky ducts and improper insulation can lead homeowners to spend exorbitant sums for energy bills. Additionally, dangerous microbes seep right through the living space and contaminate breathing air. Insects like wasps, roaches and termites bring disease and ruin to the premises. “Predators” like rats, bats and squirrels, rip holes and start nibbling on any exposed electrical wires and wreck insulation. They also leave smelly droppings behind. When excessive moisture develops, it paves the way for mold and mildew, rotting wooden beams which can cause issues for the foundational level of your home. Step one towards a comfortable, hygienic and healthy property is to get the attic and crawl space thoroughly inspected and tested for radon gas, a known carcinogen. Quartz Solutions’ professional team will visit the premises free of charge to evaluate the space, discuss the situation and help formulate a plan of action. 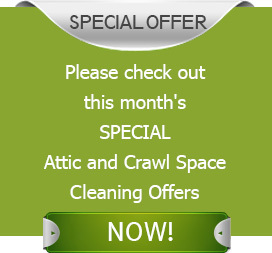 No matter what the condition, our experience, expertise, and latest cleaning techniques will ensure your attic and crawl space is soon clean and healthy. If the areas require cleaning and decontamination, Quartz Solutions will get down to work right away. Salvaging whatever is possible from the waste and debris will be our first priority. We will then remove everything that could degrade the energy efficiency & air quality of your property. We realize the value of hard earned, hence we strive to get all the cleaning work done right and done efficiently all within your budget. Dover is a compact town in Morris County NJ with a lovely community and strong family values. We understand the importance of a healthy and safe environment for your family. Quartz Solutions want to chip in and make the homes of Dover township residents warm and welcoming. In terms of the most experienced attic and crawl space clean-up services Quartz Solutions is the number one in the industry. We focus on quality so you can rest assured that our cleaning solutions will meet your high standards. We invite you to call us today at 973-536-1013 for a free consultation or Inspection.